So, how can human service agencies make technology adoption stick? 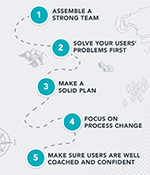 Having the right implementation team in place is make or break for project success. Bring together a broad range of individuals who can be involved in various parts of the project, including an executive leader to establish goals and expectations, a head coach to oversee implementation and troubleshoot problems, assistant coaches to collect feedback from staff as they learn the new technology, and a project management team (e.g., IT, trainers, peer advocates, etc.) to keep everything on track throughout the rollout. Solve your users’ problems first. If you’re rolling out technology that solves real problems, you can expect real adoption. Early on in the process, distribute a survey to gauge how your staff will react to new technology, identify their key pain points, and understand their questions, concerns, and barriers to technology adoption. Make sure to also include the business reason behind the survey so they understand why it’s important and how the decision will affect them. Did you know that 39% of projects fail due to lack of planning, resources, and activities? It’s essential to have a plan in place detailing the timing of the rollout, who will be involved (and at what stages), how you’re going to train and educate users, what resources you’ll need to be successful, and how to reduce potential risks associated with the project. When implementing new technology, training often focuses too much on the product itself, and not enough on the processes or people that support it. Follow a simple “Plan, Do, Study, Act” model to keep the focus where it belongs. First, identify the process your agency wants to change (plan). Then, enact the new process (do), evaluate how it’s working (study), and use the feedback you collected to finalize the new process (act). Make sure all users are well coached and confident. Users that only receive classroom training will lack confidence using new technology. If they lack confidence, they’ll lose trust, and they’ll revert back to their old ways of doing things instead of adopting the new tool. Consider a coaching model that involves hands-on training, and real-time communication and feedback. This type of training will reduce frustration and increase the likelihood that your staff will completely adopt new technology, so your agency can maximize its investment. We’ve seen the many obstacles human services agencies face when rolling out new technology — and understand the critical steps that can make all the difference between victory and failure. Ready to get started down the path to technology success? 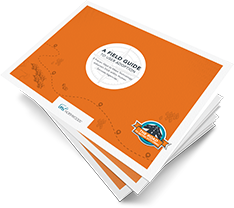 Download “A Field Guide to User Adoption” today. Technology is improving efficiencies in the workplace like never before. So why is it that so many human services agencies struggle with getting their teams to adopt these new tools? If you want to make technology adoption stick, follow these five proven – and practical – ways to make sure any new technology you roll out within your agency has the impact you’ve been planning for.